Because the girls are in an inclusion class AND have a variety of aides and therapists our Christmas list for school can get quite lengthy. So, we try to be creative and think of a nice homemade gift that saves us money but also shows our teachers how much we love and appreciate them. This year we decided to try one of those lovely mixes that comes in a jar where only a few ingredients are needed by the recipient to enjoy the treat. We looked and looked and settled on Campfire Bars. 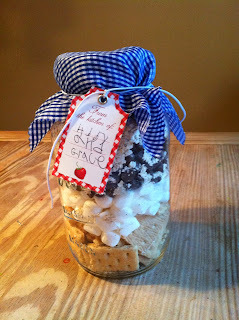 In a clean one quart jar layer the above ingredients (in order). You will need to press lightly to fit everything into a quart jar. Seal the jar with either a canning rim and lid or a plastic cap. Add decorative touches (we used a store bought cover and label) and prepare the cooking instructions on a separate card (or the label). Cooking Label: Preheat the over to 350 degrees. In a large bowl combine the contents of the jar with 6 tablespoons unsalted butter which has been melted. Stir thoroughly. Press into a cooking spray prepared 9 inch square pan. Bake 12-15 minutes and cool before serving. **Note that by using vegan dark chocolate chips (we loved trader joes) and Earth's Balance Soy Butter this becomes a vegan recipe!